After two weeks of nothing-happening four major items sold recently: Ellen Anon’s “old” 500mm and the new in the box 5D Mark III KIt offered by Chuck Pettis. The I learned that Carl Zanoni’s pristine 500 II had sold. And then Jim Bicket e-mailed saying that his immaculate 800 had sold a few days back but that he had forgotten to let me know :). Artie: I sold the 800! I was sure I wrote you last weekend to share the good news. But I cannot find my file copy of the sent email. At any rate, I am again in your debt. Your continued reminders in the blog were much appreciated and no doubt contributed to the sale. Your commission check was mailed to you on June 30ieth. Please let me know if you do not receive it or it is not in the correct amount. Happy to hear you are making progress with your health problems. I will have to make a decision on a hip replacement for the right (the good one!) soon. My arthritis not improving and may keep me from any workshop where extensive walking is involved. But we’ll keep plugging along and hope for a breakthrough. There are still some great deals and lots of used photo gear for you here. And there are a few new lenses in the pipeline that will be listed soon. It is just before 6:30 am here in Bamburgh (say BUM-bu-Ruh) as I finish today’s blog post. Our first day on the puffin boat was incredible with tame nesting seabirds at close range in all directions. After a too-sunny start we were blessed with cloudy bright conditions for the rest of the day. 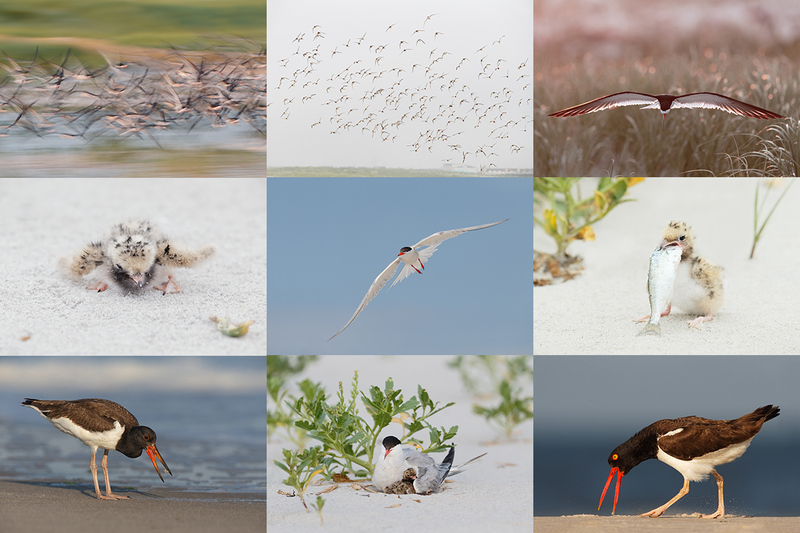 Here I share with you two of my favorites from the 1454 images that I created on the gannet boat in less than 2 hours. That is what I call frantic action. Most everyone in the group was too fatigued to photograph well before we headed back to the dock. Read the whole story below. This image was created on the gannet boat on the UK Puffins and Gannets IPT with the Canon EF 70-200mm f/2.8L IS II USM lens (hand held at 100mm) and the Canon EOS-1D X. ISO 400. Evaluative metering +1 2/3 stops off the white sky: 1/2000 sec. at f/4.5 in Manual mode. Central sensor Surround/AI Servo Rear Focus AF just caught the bird’s face and was active at the moment of exposure. Click here to see the latest version of the Rear Focus Tutorial. Click on the image to see a larger version. Image #1: Outta My Way! Denise, long-time IPT Veteran Mike Goldhamer, new BAA-friend George Golumbeski, and I were on the same flight from Newark to EDI, UA 36. We got into Edinburgh, Scotland about 20 minutes early. Soon we met up with Donna Bourdon who made her tight connection in Paris and finally found long-time IPT veteran Jean-Luc Vailliant at Domestic Arrivals; he had flown in from London…. I had envisioned us getting to our hotel in Bamburgh, UK, way too early to check in. Not. Our vans were being “delivered” to the airport and it took us more than 2 hours to find the drivers and learn a bit about our 12-passenger mini bus and our 7-passenger SUV. I had e-mailed and called the company several times to make sure that they removed the last row of seats in the mini-bus and had confirmed that we were to have a GPS in each vehicle. They had removed the last row of seats but there were no GPS units in sight anywhere :). After a round of phone calls we realized that we would be going GPS-less. George came to our rescue and Google Maps on his I-phone has been our guiding beacon ever since. Thank God for Mr. Golumbeski! South we headed down the A1 looking for some gas; both vehicles had been delivered practically empty. I was driving the mini-bus. I guess that it was mini as compared to a Greyhound bus but I kept hitting the curb on the right and driving over the medians when I turned the monster. Ah, I forgot to mention a few things: Denise and I would need to remember to drive on what for us was the “wrong” side of the road. And both vehicles had manual transmissions. We had anticipated that not being a problem at all until we realized that we would have to work the stick with our left hands. That frazzled my brain. I kept reaching out with my right hand for the stick and when it was not there I found myself for no reason at all trying to operate both the clutch pedal and the brake pedal with my left foot. That with the expected result of the vehicle coming to a shuddering stop in the middle of the highway…. While I had been confident before I got into the driver’s seat and Denise had been somewhat fearful, she did much better than I did. We finally found a petrol station in Dunbar; filling up both vehicles with diesel foul cost in excess of $350 US dollars. We had a leisurely meal at a nearby garden shop where they refused to take our lunch orders until precisely 12 noon. During lunch I came up with a great plan. We would enjoy some down time and then head to Dunbar harbor to meet the boatman thus saving an 80 minute drive south followed by an 80 minute drive north to wind up pretty much in the same spot. Great plan not. It was Donna who realized that we would need to do the drive in order to pick up Bear Boat veteran David Neilson and his wife Robin who had arrived a few days early and were already in Bamburgh. Now we were worried about getting to the hotel and getting to the boat on time. We arrived at the hotel at about 2pm, got checked in, and realized that it would make total sense to take only the larger vehicle. So we did. And I drove since Denise was having no part of our not-mini-bus. On the way to the dock I realized that I had left the 3,000 British pounds in cash in my laptop bag that was safely in the hotel room. When we finally arrived a few minutes late our boatman was not a happy boatman. In fact, when I began to speak he knew what was coming. In short order he agreed to take us out. I would pay him the cash for both trips when we returned on July 7th. 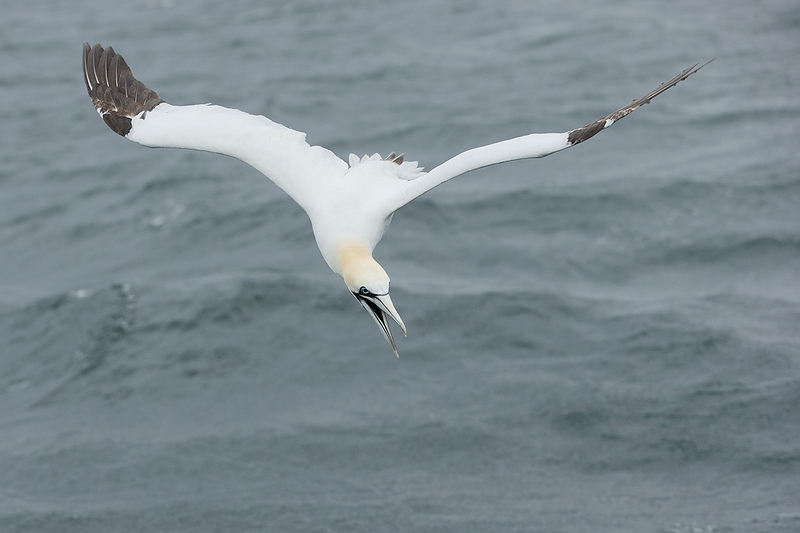 Having baited gannets with fish previously at another location, I said to the captain, “These folks have no idea what to expect.” He said in his thick Scottish brogue, “You have too much confidence in us laddie.” Again he was teasing me. Once we got the birds coming, the action was nonstop for about 90 minutes. At the one hour mark most folks quit because they no longer had the strength to raise their lenses. I carefully explained to the captain exactly how to position the boat and where to have Eric the mate toss the dabs. Though the action was amazing the photography was difficult. There were so many birds in the air at once that isolating a single bird was nearly impossible. I kept going the whole time though I am not sure how. But even I was forced to give up the ghost after a while. We were back at the dock by 7:20pm and I was driving south in short order. We planned to stop for some chow in Berwick (say BERR-ick) as it was about the halfway mark between Dunbar and Bamburgh. Was I tired when we started? Well, actually I was far beyond tired. And jet-lagged. I had slept for about 2 hours on the flight over. As I had gotten up at 5am on Tuesday to finish packing that meant that I had had 2 hours of sleep in the previous 32 hours…. When we stopped at a pub for dinner I grabbed a bag of potato chips and napped in the car while the group ate. I would not have made it safely back to the hotel without that nap. Beautiful images. I enjoy reading about your travel adventures. Maybe it’s the march of time, Artie. Joints fail, coordination deteriorates and adaptation to change slows down. I live in the UK so left handed gear changing comes naturally but I also have a track car with a 500 hp 6.3 Chevy engine and that has a brutal right hand shift in the tunnel on my right side. It’s not a problem. Maybe you should ask someone in the UK to organise this end of the trip. It would not be a big deal to organise the vehicles (with GPS), have them ready at the airport for the group, drive you all up North and drive to and from the boats embarkation points etc..
All for the cost of a free place on the trip. 2nd image by far the best.No sympathy for you on travel issues. Been there done that long before they even thought of GPS’s. Paper maps only back the and you had to buy them. Love the round-a-bouts. Wrong side wrong way, shifting with wrong hand but at least floor control petals were the same. Will strengthen your character and give you confidence when you travel to more exotic locations! Take your pick South America or the Pacific Rim countries. Glad that you liked that one Lady D.
Great second image,the feet, the head turn & the feather detail. Sounds a fun trip, hopefully I’ll be able to attend an IPT one day! I love your ” Story-Telling ” … It’s as great as your Images . And, Oh , How I Identify with your ” Body-Issues ” … I am ” Seeing ” us all getting better. I remember that feeling of winding the rental car up in first gear, keeping up with traffic from a red light or something, then reaching down with my right hand and finding nothing but the crank for the window and feeling like a fool while the cars behind start to close in. Right hand quickly back to the wheel and left reaching for the gearshift lever. Get some rest and enjoy the trip. My favorite is the second frame. The open bill and extended feet are what caught my eye but it’s the feather detail that makes it for me. 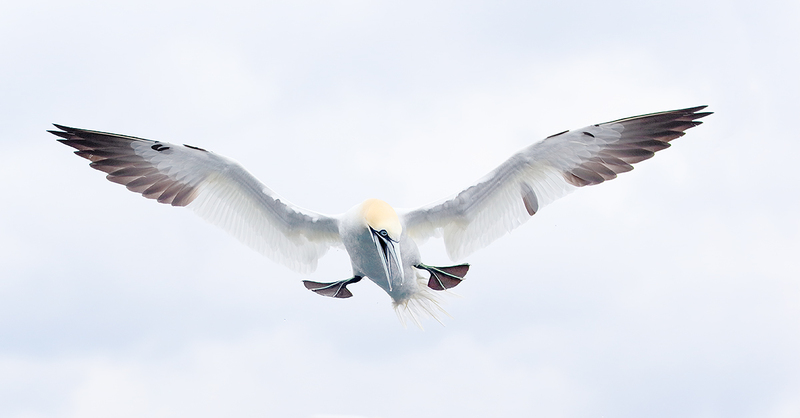 the 1st Gannet shot is awesome. I like the ocean in the background, the open bill and the top-down view. Great light! Absolutely stunning shot!